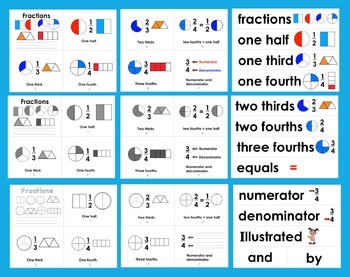 Use for a fractions introduction or review. 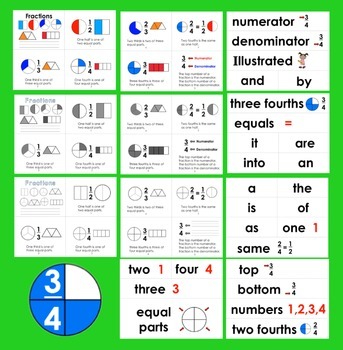 ★ PLUS Illustrated Fractions Vocabulary Cards for a Fractions Math Word Wall or Pocket Chart included. 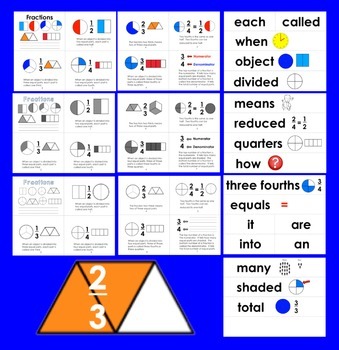 3) Versions for students to color in fractions to show their understanding. Level 1: “Fractions” is the easiest level. 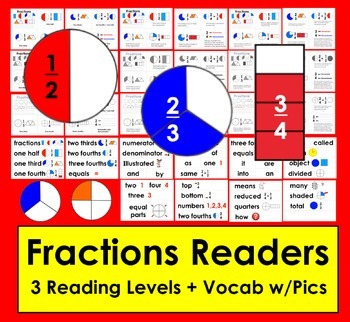 Level 2: “Fractions” is a version that is a bit harder, more sight words, picture clues, and longer sentences. Version 1 of each level: High frequency words and full color illustrations help younger learners to use their reading strategies: pictures, phonics and context. Version 2 of each level: Same text, but black and white illustrations for students to read and color. Version 3 of each level: Same text but students show their comprehension and understanding by shading fractions and identifying the numerator and denominator.